The State Bank of Vietnam set the daily reference exchange rate on March 18 at 22,952 VND per USD, down 5 VND from the last working day of previous week (March 15). With the current trading band of +/- 3 percent, the ceiling rate applied to commercial banks during the day is 23,640 VND/USD and the floor rate 22,264 VND/USD. Meanwhile, the opening hour rates at commercial banks continued to stay stable. Both Vietcombank and BIDV kept their rates unchanged from March 15, listing the buying rate at 23,150 VND/USD and the selling rate at 23,250 VND/USD. Techcombank also continued to maintain the same rates as on March 15, at 23,130 VND/USD (buying) and 23,250 VND/USD (selling). The rates listed by commercial banks have remained stable since March 1. 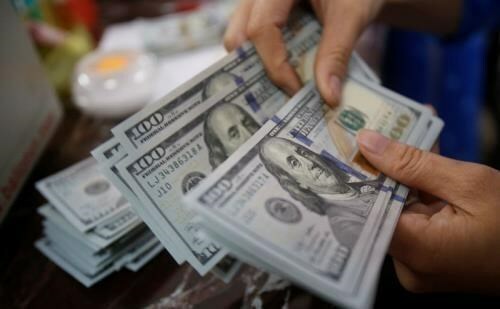 During the week from March 11 to 15, the State Bank of Vietnam adjusted the daily reference exchange rate up on the first day of the week, but revised it down on the next two days before raising the rate on the last two days. On March 15, the rate was set at 22,957 VND per USD, 7 VND higher than the rate on the week’s beginning.